Figure 6.9: Schematic of the aerovator, seen from the side. km (620 miles) and a total mass of 240 metric tons (529,000 pounds). The aerovator would make one rotation every 13 minutes and needs to be propelled by a 5 mega-newton push provided by jet engines. 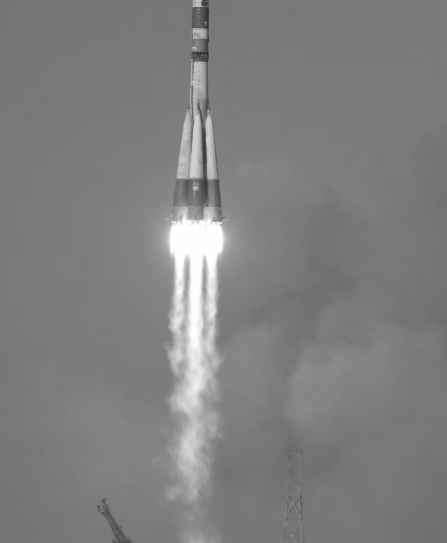 The part of the aerovator extending from the ground-based hub into the upper atmosphere is called the ascent section. This section is rotating through the atmosphere, and thus has considerable aerodynamic drag acting on it. The rotational speed increases with the horizontal distance from the hub, and the aerodynamic drag increases with the square of the velocity. At the same time the drag is a linear function of the atmospheric density, which decreases with altitude. This means that the ascent section needs to be kept as short as possible and requires a steep rise; the more vertical this section, the lower the rotational velocity (because of the short horizontal distance) and the less tether length moving through the dense lower atmosphere. However, if possible, the ascent also should be kept shallow enough to allow the payload to slide upward under the influence of centrifugal force alone. The ascent section needs to contain the propulsion point, where jet engines are envisioned to be attached to keep the aerovator in motion. Existing large jet engines are most efficient at velocities somewhat below the speed of sound (called Mach 1) and at altitudes of around 12 km (8 miles)— the optimal cruise conditions for large commercial aircraft. Calculations on the aerovator show that the optimal location for the propulsion point is between 20 km (12 miles) and 40 km (25 miles) out from the hub in horizontal direction (where the rotational velocity of the tether is between Mach 0.5 and 1). Avertical altitude of 12 km and a horizontal distance of 20 km means an initial ascent angle of 31 degrees. The Internet group calculated that about 20 Boeing 747 jet engines would be required to propel the aerovator and match the aerodynamic drag acting on it. Rather than permanently attaching jet engines, tug planes carrying their own fuel could be docked to the ribbon and relieved by other planes when they are out of fuel or require maintenance. At 100 to 200 km (60 to 120 miles) out from the hub, the ribbon would extend high enough to enable an equilibrium between aerodynamic lift pushing the tether up and gravity pulling it down, what the group calls a "skim'' equilibrium. The skim equilibrium section would also rotate at such extremely high velocities, reaching orbital velocity at the far end of the tether, that the centrifugal force in vertical direction reduces the net weight of the tether and thus limits the amount of lift required (the section is in effect partially in orbit). Preliminary calculations indicate that the low air density offsets the high velocities in such a way that aerodynamic heating should not be a significant problem. To create sufficient lift, the skim equilibrium section of the ribbon must have an airfoil shape, like the wing of an aircraft. It must also be aerodynamically stable, meaning that it should be able to automatically orient itself to ensure an optimal angle of the wing with respect to the air in the direction of the velocity. This is called a wing's angle of attack. A too shallow angle means insufficient lift, which will result in a drop in altitude, while a too steep angle results in too much drag and eventually a loss of lift due to aerodynamic stall (which happens when the airflow can no longer nicely follow the curvature of the wing). It is likely that aerodynamic stabilizers will be required, as on an airplane. For that, the designers envision very lightweight feathered rods that extend downwind and are attached to the ribbon at a proper angle. The strong tension along the ribbon will ensure that it remains taut, providing lengthwise stability. Seen from above, the aerovator will have a distinct "L" shape, with the shorter leg being the part of the tether ribbon between the hub and the propulsion point, and the longer leg the part from there to the tip. The shape of the ribbon's path is determined by a balance between centrifugal forces, aerodynamic drag, propulsion, and the tension in the tether ribbon. The section between the hub and the propulsion point is essentially a straight line, with only limited bending due to drag. The pull of the jet engines at the propulsion point creates a sharp, nearly 90-degree bend back with respect to the direction of rotation. From there, the ribbon follows a smooth bend all the way to the tip (Fig. 6.10). Figure 6.10: The aerovator seen from above. as a free-flying satellite. Once the payload is released, it can reach its final orbit with the help of a small rocket propulsion module. The second possibility is to have the payload move freely along the ribbon. Due to the centrifugal force, the payload will automatically accelerate outward, achieving a velocity of about 11 km per second (7 miles per second) when it reaches the ribbon's end (which means it will actually move faster than the tip and thus has more than the minimal orbital velocity when it leaves the aerovator). You can easily demonstrate this principle yourself by twirling a rope over your head and then attaching a free-sliding ring near your hand; it will automatically glide along the rope and be launched away from the tip. A free-moving payload does not require brakes, but a highvelocity, low-friction method of attachment to the ribbon will be needed. Otherwise the tether would quickly wear out, temperatures caused by friction could easily become too high, and the required payload velocity may not be reached. The use of magnetic forces or some form of gas cushioning may be possible. As the aerovator requires an initial steep ascent, the payload may need some help to get going during the very first part of its trip, where the centrifugal force may be insufficient to overcome gravity. For the "grabbing'' payload a powered wheel vehicle could be used; for the free-moving payload this is also a possibility, as it could be released at the point where the centrifugal force is sufficient to carry it along further. The design group thinks that the aerovator could be deployed entirely from Earth's surface, with the ribbon being played out from the rotating hub and aerodynamically lifting itself up as it is extended. However, as the group points out, the hub will very probably need to rotate much faster than in the fully extended state to make this possible. Using tug-planes for propulsion, the aerovator tether is envisioned to be not much more than a thin ribbon that could be regularly dropped for repairs and redeployed or replaced when needed. Being just a thin and light ribbon, the danger of the aerovator causing serious damage and injuries in case of malfunction is also expected to be very low. If the ribbon were to be cut anywhere along its length, the lowest parts would gently flutter to the ground, while the high-speed upper parts would burn up when falling into the increasingly denser atmosphere. Crewed payload vehicles would need to be equipped with heat shields and parachutes to allow a safe landing in case of a break in the ribbon or a premature detachment, but as these components would be needed anyway to get back to Earth at the end of the mission, that should not be a problem. Like the space elevator, the aerovator concept relies mostly on the availability of super-strong, lightweight, nanotube materials that do not yet exist. Apart from that, the dynamics of deployment and stability control will likely be very complicated. Nevertheless, although not as far developed as the space elevator concept, the concept seems to be credible.